If you haven’t heard of TGIMBOEJ (The Great Internet Migratory Box Of Electronics Junk), you should definitely check it out. The basic idea is that a box of random electronic junk gets shipped between makers and tinkerers, each of whom take something and contribute something to the box, and document what they end up doing. To make a long story short, I was recently offered a chance to receive one of these migratory lending libraries, so expect to see something in this space about it soon. Posted by sethjust on Monday, May 3, 2010, at 8:08 pm. Filed under Electronics, Internet. 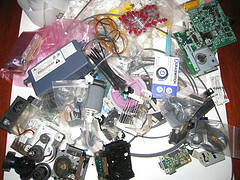 Tagged diy, Electronics, exchange, free, junk, project, tgimboej. Follow any responses to this post with its comments RSS feed. You can post a comment or trackback from your blog.